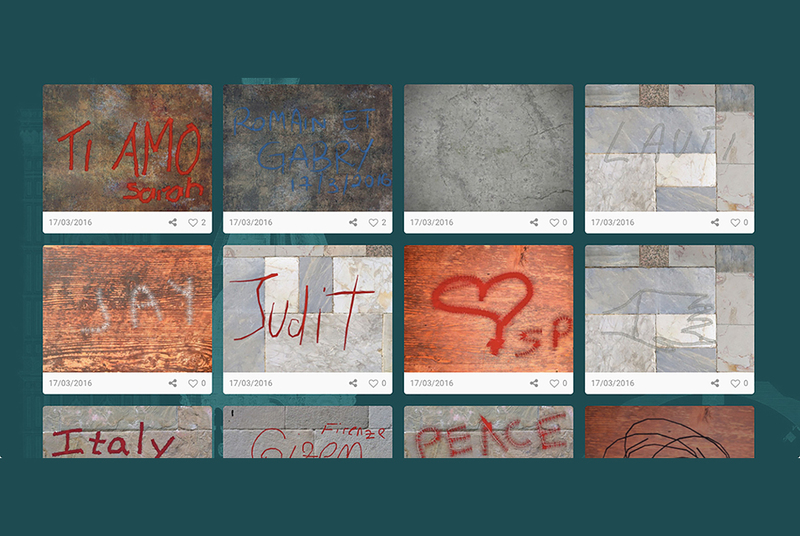 A screenshot shows digital graffitis made by visitors at the Giotto's bell tower of Santa Maria del Fiore cathedral and archived on the website "Autography" on March 17, 2016 in Florence. The digital message can be done choosing between different tools (pen, marker, paintbrush, spray and pencil), colours and virtual surfaces. Three tablets are now on display in the Giottos bell tower hoping that visitors will leave their marks virtually instead of on the monuments walls. The messages will be stored on the "Autography" website and archived online. VINCENZO PINTO / AFP. FLORENCE (AFP).- The days of scribbling "I woz here" on Florence's historic monuments are gone: from now on would-be vandals will be able to graffiti via app instead, with their messages kept for posterity. "We have been protecting masterpieces for centuries: starting from today we are going to remove graffiti from the Campanile's walls. But if you -- virtually -- leave us a message, we will preserve it: just like a masterpiece," it says. "Three months ago, when we began cleaning the walls, which had never been done before, we asked ourselves how we could avoid all the work going to waste in a short time," said Alice Filipponi, social media manager for Opera di Santa Maria del Fiore, a not-for-profit organisation tasked with preserving many of Florence's monuments. Architect Beatrice Agostini, who heads up the organisation's restoration arm, said the bell tower "was in an incredibly degraded and dirty condition", with all elements -- marble, stone, wood and brick -- damaged by graffiti. Three digital tablets have been installed on the 1st, 3rd and 4th floors of the tower and the messages are stored online (http://autography.operaduomo.firenze.it/). Over 700 personalised scrawls were collected in the first week. Undeterred, conservators will turn their scrubbing brushes next year to the Cathedral's dome -- the largest such structure in brick ever constructed -- and install tablets with the Autography app there as well.